With Bush going to Colorado Springs, NORTHCOM, I am reading more and more about how he has lost control. Cheney getting surgery. Do you feel any coup has occurred or coincidence? More and more letters to the Internet are starting to echo this. What happened to the swagger, the bravado, quips like 'bring em on' re the attacks against US soldiers in Iraq? Bush looks defeated, deflated, depressed, and frankly scared. Is it the hurricanes? Nothing new, especially with a brother as Governor of Florida. Just swagger in and talk about all the federal assistance you're going to muster, another photo opportunity. Even after Katrina, which embarrassed Bush as he has made himself so insulated that he was frankly unaware of the damage the rest of the world was watching on TV, in horror, he did not lose his swagger. There have, of course, been setbacks. The plan to extend the tax cut to the rich, on hold. The plan to privatize Social Security to pour these funds into a faltering Stock Market, no longer even mentioned. The plans to invade Iran to pre-empt any nuclear threat, by rallying the rest of the world at the UN, a fizzle. The plans to invade Iran and Venezuela for their oil reserves, stymied because the US Military is needed at home, and is insisting it must leave Iraq to attend to the home front, rather than securing and guarding oil reserves for the Bush crowd. But all these setbacks are not new. The loss of his swagger is new, and has presented just since his visit to NORTHCOM on the day hurricane Rita hit, and military exercises simulating Martial Law were in full swing around the nation. Is there a relationship? We have mentioned that the US Military revolted against Bush during the vacation month of August 2003, removing the 'football' from his control, the nuclear codes, and relaying that he was no longer considered their Commander-in-Chief. Gore, as the legitimately elected Commander-in-Chief, was whom they were reporting to, in the interim. All branches of the US Military except the Navy were so inclined, the Navy with their nuclear submarines and control of time keeping and observatories remaining loyal. Thus, we recently had an admiral assigned to NORTHCOM, the military arm of Homeland Security for defense of the entire North American Continent. We have also mentioned that recently the Navy was signaling a switch, the military altogether in revolt against the Bush cabal. Bush was not invited to go to NORTHCOM for the exercises during the busy weekend when Rita was slamming the coast and VP Cheney was in surgery, he was taken there, under arrest. The unmistakable change in his visage after being released a clue to what occurred. Scared, unable to smile. Wearing the same shirt for days, even when appearing in public. Cowed, brought to heel. What happened at NORTHCOM? As we have mentioned, the original Bush plan was to become dictator of the world, secure all the oil fields and guard them with the US Military, impose Martial Law in the US using the existing statutes allowing FEMA to take control in emergencies and via the new and powerful Homeland Security statutes, become dictator for life. Homeland Security reports to Bush, and FEMA reports to Homeland Security, thus, by assigning control over to FEMA, the President has in essence given himself dictator powers. No more elections. No more Congress. Just Bush for life while controlling federal, state, and local governments by the strong arm of the US Military. Or so went the plan. If the US Military was in revolt, except for the Navy, find a way around the top brass, coming in the side door via NORTHCOM and Homeland Security. This all assumes that NORTHCOM and the Navy continue to be willing to follow the dictates of Homeland Security. Oops. They have some bad news for Bush and company. They joined the revolt. What now? As has been amply demonstrated, FEMA and Homeland Security, without the US Military, are pathetic, and have no clout. Especially in the face of real emergencies, such as Katrina, and these real emergencies are just starting. In the public relations dance that occurred after Katrina, it seemed the US Military and Coast Guard were cooperating, subservient, but this belied the drama behind the scenes. It was either/or. Either we had the Bush administration arm coming down through Homeland Security and FEMA, or we had the military. The range of control that Bush has established, from himself and Cheney downward, is littered with incompetents, else Bush feels threatened. If one analyzes the agencies that now ally with the Bush administration, or line up against, Bush has a weak field. The bulk of the people in the agencies want to do their duty, not operate as the arm of another Hitler with megalomaniac tendencies. Resistance is broad and deep. Bush attempted a counter-coup by assigning an Admiral to NORTHCOM, but this failed. The face of a frightened Bush tells all. There are no other plans or schemes in place, no recouping of resources, no second parry. He stands as a figurehead, only, hoping to appease those truly in control, and hoping that no one notices his fall from grace. http://www.globalresearch.ca/index.php? [Sep 24] US Northern Command and Hurricane Rita. Until the 24th of September, there was no indication, from official and/or media sources of Secretary Rumsfeld's participation in the NorthCom meetings. It is now confirmed that a top level meeting was held under NorthCom auspices, which included the participation of President Bush, Defense Secretary Don Rumsfeld (through video call), DHS secretary Michael Chertoff and FEMA Director Vice Admiral Thad Allen (video call). This meeting had been planned well in advance. US public opinion was not informed. 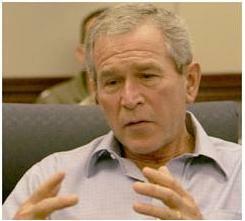 It was not mentioned by president Bush at his September 23 Press Conference.